It’s no different than society in general. There are always the quiet ones. Look at any classroom in any school in America. There is bound to be a kid or two that just keeps to themselves and gets their business done in their own way. Look at any group of friends out at the movies or out at the bar. There will likely be a quiet one of the bunch; someone who does just as much as the rest, but is not the talkative type. Just to get that much out of Carter isn’t really surprising, but it isn’t something that you should expect him to come up and just say to you. Upon meeting Carter, getting him to say more than 10 words to you is a chore in itself. But that takes nothing away from Carter’s driving talents. Carter, the 24-year-old son of former NASCAR Winston/Nextel Cup team owner Travis Carter, has found his niche in the Pro Cup Series, even if that niche is that of a quiet killer. 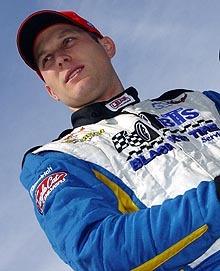 Carter was a surprising winner of the Rookie of the Year in 2004. And look at the field of USAR Hooters Pro Cup Series drivers and you’ll see a couple quiet ones as well. One of those you’ll see, sometimes standing by himself waiting for driver introductions to start or just watching his team work on the car or just relaxing and waiting for the next practice to begin… the 2004 Hooters Pro Cup Series Rookie of the Year, Matt Carter. “I pretty much just like to come to the track and just get it done. I’m a ‘keep to myself’ type of guy I guess. That is how I’ve always been. I’m real quiet. I don’t just walk up to people and start a conversation. That is just my personality. 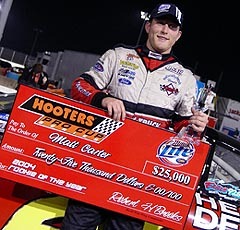 Carter, in his first full season with the series, earned the 2004 Miller Lite Pro Cup Series Rookie of the Year award, earning five top-five and 12 top-10 finishes in 17 races last season. This year, just like any driver, he wants to improve. But after seven races, Carter finds himself just ninth in the points and with just four top-10 finishes in the first seven events. 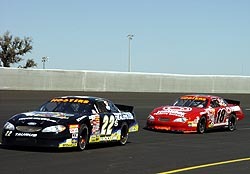 be higher up the racing ladder at the age 24, especially with the background he comes from; growing up around racing. However, Carter didn’t begin his own racing career until just a few years ago, after he got out of high school and a year of college. “The first track I ever went to was Daytona (International Speedway) and I was seven weeks old. I used to go with dad and my parents all over the country to races. I had a normal childhood, but I liked going to the races. That was the time to go in my life and my parents knew that. I’m glad I got to grow up in that environment. Not a lot of people get to and I’m sure a lot of people would like to. It was pretty cool. “I have a sister and my mom that was always with me when dad wasn’t around, so a lot of the time growing up I was always hanging around with two women. “Maybe that’s another reason why I’m quiet,” joked Carter, with a smile on his face. The mindset that Carter was born and raised in a very successful racing family would lead one to believe his start in racing would have come early. However, that was not the case, even though he was interested for a time. “I always wanted to race, but my dad would never let me until I got older. I begged him since I was a little kid, but he would never let me. So I stayed busy doing other things, like playing football and baseball and stuff. In high school though, while some of his friends went racing, and even though Carter wanted to as well, he became rather good at another sport; football. “I played quarterback in high school. In college, I played strong safety. I was on the practice team (in college) for a while, so that kinda sucked. I was pretty good at that though. “I was actually pretty good at football. I think I was probably better at that than I am at racing right now. So I’m trying to get it evened out. “I went to Appalachian State University for a year and played football. I decided that I didn’t want to do that and I wanted to race. I knew college football wasn’t for me and I was still a big racing fan. So I gave up on football, even though I’m still a huge fan. “Finally, (my dad) decided to give me a chance to race and we got pretty serious about it. I was 18 the first time I tried it. I ran a couple of dirt go-kart races when I was 10 or 11 with a buddy of mine, but that was it. 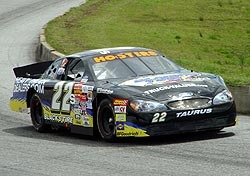 Carter started in the late model series at Tri-County Speedway, where he ran for about a year and a half before it shut down. 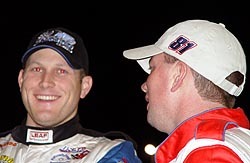 Then, Carter moved to Hickory Motor Speedway and ran there for about two and a half years before earning the track championship in 2003. 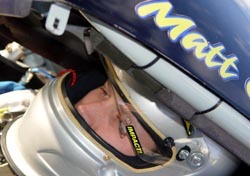 Then, with the full-on help from his father, Matt moved into the Pro Cup Series and became a member of the Ricky Benton Racing organization, the team that had won the Pro Cup Series championship in 2002 with driver Jason Sarvis. Now, it was time for Matt, the former college football player, to be a full-time racecar driver and to try to make a living out of it, much like his dad did for many, many years. “He’s 100-percent into my career. He has always supported me 100-percent in anything I’ve done. He always said he’d rather me not race, but if I did, he was going to support me 100-percent in it. That is cool to have any parent do for their kids. “I would really like to continue doing this racing thing. This is the only thing I do now. You can only go so far in this though and everyone reaches a point to finally quit it. I mean, we all know there is only so far you can go in this thing. Not everyone is going to make it to that very top level. “I knew that when we started this. We figured we’d see if this might be able to lead anywhere. If not, we figured we’d stop and not waste money on it. Hopefully, I can move on up the ladder and get paid to do it. And being just six years into his racing career at the age of 24, Carter knows racing right into the top levels won’t be easy. One of the biggest criticisms about Carter during his career has been something that, when looking back on his past, is really kind of ironic. Carter, the large-structured guy who was a former standout football player, has been criticized at times for not quite being aggressive enough on the track. “That is what is weird. Playing football, I loved to hit people. That was one of the greatest feelings in the world. Now, I’m the exact opposite. I don’t know why. I’m trying to get my mindset back to that mentality. It is just hard to figure out when to be aggressive and not to be aggressive in racing. In football, you were aggressive all the time. Carter has found some friends in the Pro Cup Series, including with Shane Huffman. So, after just six years, the question still remains if Carter will make it to the “big leagues” in the future, or if he’ll be focusing on something else in his life down the line. But with his background, he’s got a pretty good chance. And with the drivers he got to grow up around and those he’d like to be modeled around, he’s got a better shot yet. “It was always cool being around the Winston Cup garage area because I got to meet some great drivers. Dad had a lot of great drivers. Harry Gant was one of them. He is an awesome guy. So the next time you see Carter just standing around, likely by himself, take a little bit of time to go and talk to the youngster. He might not be big on words, but on the track, he might be big on talent. And with Carter, he’d rather let his driving do the talking than him. And in the future, he could make a lot of noise. That would be big for someone like Matt Carter. Some of today's rookies, like Andrew Rogers (#18), could look at Carter's 2004 season to figure out how to do it.